3: I Guess Hirohito Just Couldn’t Wait. I’m afraid that simple “thank you” would be inadequate to express my gratitude–I don’t know what I can say, but I want you to know how much I appreciate your thinking of me in that way. As you seem to have sensed, I ended the year with a shade less than zero in my allotted budget, and was having a very difficult time gathering the money together to show Rusty a good time. So at the time that it came it was most particularly welcome since it solved all my problems. Of course since then the bottom has dropped out of my little plans–Rusty isn’t coming after all. Her father muttered something about wartime economy, the fact that I had just been out there, and knowing that she was planning to visit me in a few months at Quantico, and laid down the law that she couldn’t come. I was–we were counting on it a lot, and tho I still don’t agree with him there’s nothing I can do but acquiesce–but the money is being spent on a good time for the girls and myself–a trip to Atlantic City, eating out, some shows when we get back to New York. Thank you for your warm congratulations on my law school year; I did work hard–very hard the first semester, and only less so the second because I knew that I was leaving–it’s very difficult to work under those conditions. Those marks haven’t been returned yet but at least they won’t be low enough to put a blot on my record–I hope. I did finish my note for the Journal; the first of four legs on an editorship, and the staff liked it well enough to accept and publish it with very little change. Coming out in the July issue I think–on In re Barnett, a second circuit case on the liberalization of appellate procedure. The subject isn’t just naturally fascinating, but as so always seems to be the case in Law, I found it became so as soon as I had done a little preliminary spade-work in the field. I will be given credit for it and another chance to compete whenever I get back–so that at least is something behind me. I would have infinitely preferred it if this war had hit me just at the end of my law school career, but I guess Hirohito just couldn’t wait. I wish my acquisition of a commission were as simple and automatic as you implied–in fact it seems to be a long, risky and extremely arduous process. Three months intensive training at Quantico, VA, during which time almost half the class is dropped, before getting a commission, then three more months of polishing and specialization in one of the many tender arts of war. I think I would rather take up something like field artillery than say the parachute troops, but you don’t have much choice. One of the things I like best about it is that all the boys going in with me are required to be college graduates, who have had no previous military training–so whatever I’ll be doing, it’ll be done in good company. I’m looking forward to it in many ways, and for many reasons–the best of which is that I won’t make of a success of it if I don’t. The three of us have been having a very quiet, restful time down here, which was just what we needed. Mother has put on a little weight, and with sunning on the beach and all she looks better than she has in some time. Seems in better spirits too, for all of which we are very thankful. Wish I could see you and Martha and the boys–they must have grown a lot this last year–I still may have a chance to on our way back to the city. Give my very best to Martha, and thank you again for the magnificent gift. 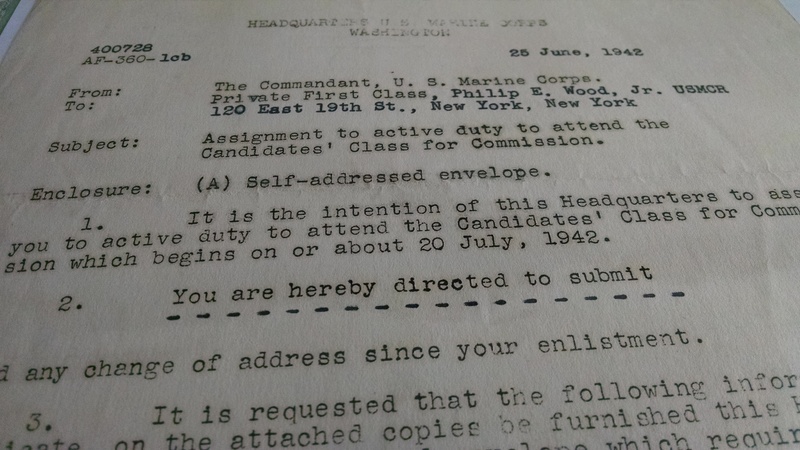 After jumping through the necessary hoops and securing medical waiver, Phil Wood was sworn in to the United States Marine Corps on April 2, 1942–the oath administered by the same Lieutenant Detchon who’d lectured on the Corps in February. He was encouraged to finish out his year at Yale and enjoy his last few weeks of civilian life–before reporting, without fail, as soon as ordered. Spending a last summer at the picturesque South Jersey shore seemed ideal, if a little disappointing without Rusty’s company. Phil does get one thing right, though: the vast majority of new officers were recent college graduates with no prior training. Class rosters were a veritable Who’s Who of notable athletes, bright scholars, and incorrigible frat-house libertines from the best schools in the country. Some would become great leaders or career officers; others would wash out and try their luck in the other services. The Marine Corps was very good at making–or breaking–its candidates. Undated, but appears to be in the early summer of 1942, between the end of the school year and Phil’s departure for Quantico. The address is in Ocean City, New Jersey. Howard Heath Rapp, Phil’s uncle on his mother’s side. Mr. Davis took a dim view of his daughter’s relationship with Phil, which would eventually have serious repercussions. Referring to joining the service. “Vacation by Appellate Courts of Orders concerning Non–Appealing Parties,” The Yale Law Journal Vol. 51, No. 8 (Jun., 1942): 1406–1411.